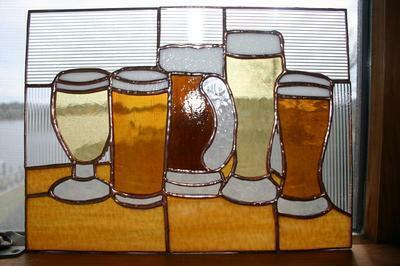 Stained Glass Panel with Beer! My husband makes his own craft beer and wine. He is quite good and has received many awards and ribbons (came in 3rd place in the USA). I love to brag on him. Anyway, this was my first real attempt working with Stained Glass. I designed the pieces and my hubby made sure the dimensions were correct to fit into 2 panels of a 6 panel door. The solder is not so good. I used copper patnia and after about a month the solder started turning white. I was told that was because I did not clean the solder very well. I tried to clean it up but it did not work….now it just looks like it has been there for years! It is still a conversation piece! It’s making me want to try some, my mouth is actually watering. LOL! You’ve done a really good job with these Leslie, ESPECIALLY as they were your first attempt at stained glass. You’re very brave to design your own patterns, too. Very nice. I like the way you’ve linked the two panels together with colour of the table, and the sense of perspective in the wine one. Very clever. There’s a tiny point I’m going to make about the design that you’re welcome to disagree with. The two vertical lines coming down from the beer glasses – they might’ve been better at an angle, to emphasise the table. As they are, they jar a bit with the perspective you’ve so carefully set up. And because the left one is lined up with the line at the top, it sort of visually cuts the design in half. Do you see what I mean? It’s a very small thing, I hope you don’t mind me saying. I love the subtle differences in the coloured glass you’ve chosen for the beers – it’s a great touch and really gives a sense of the hand made quality of the beer. A good example of carefully chosen glass. And the cutting around the wine bottle label is very well done. Very tricky for a beginner, well done you! Just one question: are the grapes fused? I can’t quite see from the size of the photo. Oh, one more thing. You could try rubbing very fine steel wool to remove the oxidation, but it looks like you’ve put copper patina on (? hard to see), which would be hard to reapply vertically! Looking forward to your next creations. Either you’re pressing too hard, you have a new grinder head or you’ve got a coarse one. Try letting the stained glass grinder head do the work on its own. Especially if you’ve just changed it for a new one, it takes a bit of time to get used to the reduced pressure needed.